I realize that I've left everyone with a cliffhanger about Emily the Spider. 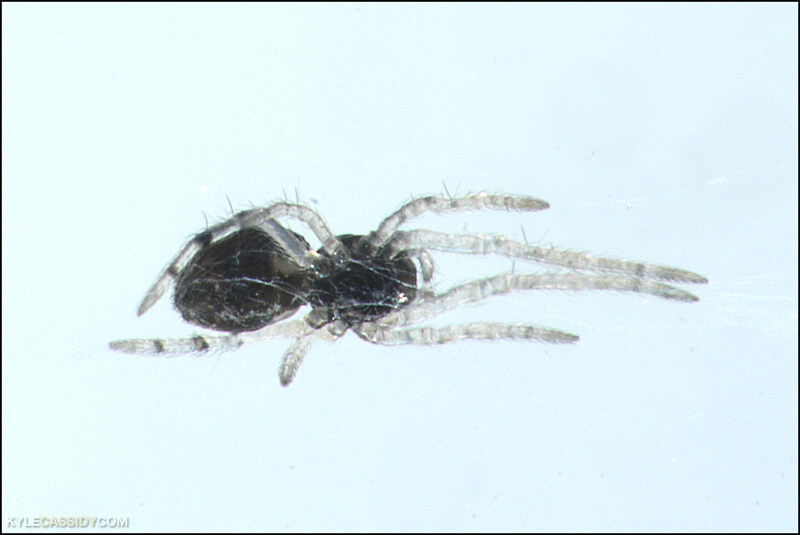 When last we checked, Emily's egg sac, which I'd taken from her web like a thief after parasitic chalcid wasps had killed all of her other babies, and kept in a jar in my room, had hatched four babies. Four. 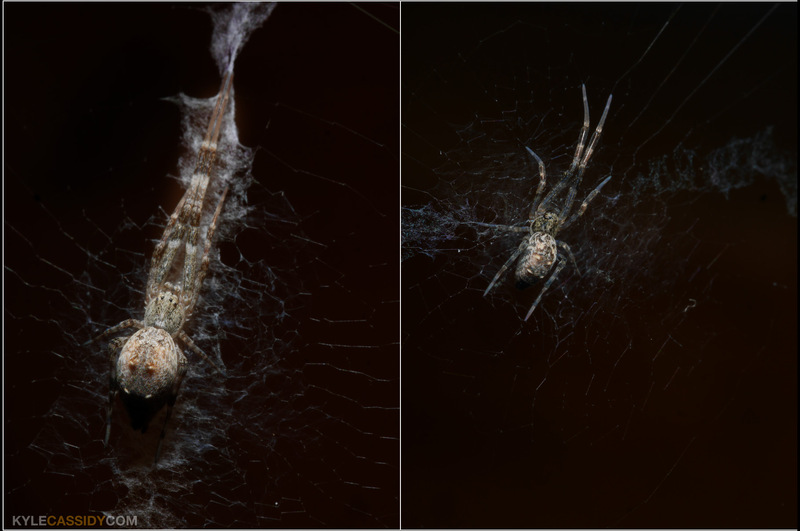 I'd really no idea how many spider babies came out of an uloborid egg sac, but now we know, not many. 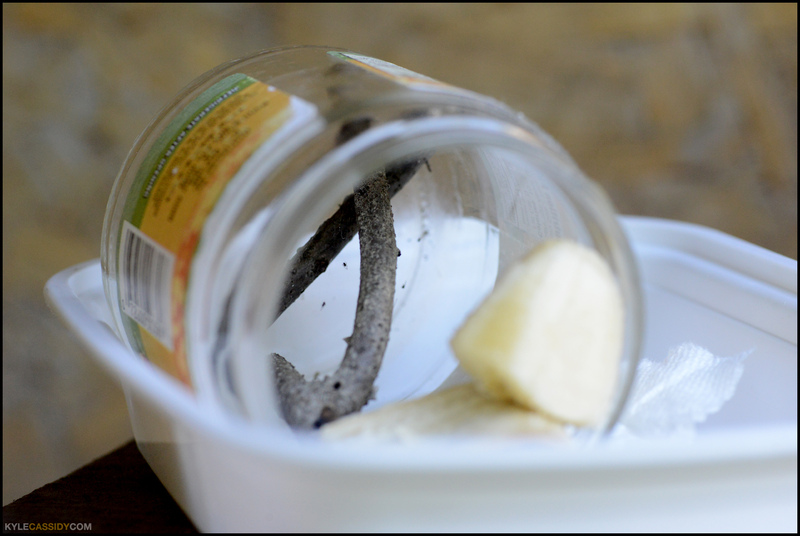 These kids took up residence in a Vegemite jar that I'd set up a baffle of sticks inside for their web building. (You can see them here.) They were adorable glass-like creatures, translucent and soooo small maybe 1/4 the size of a pinhead. I put a banana in front of their cave and over the next two weeks that banana was turned into its exact weight in fruit flies which turned into a food cloud for the bubs. Emily's babies got bigger -- and how could they not? 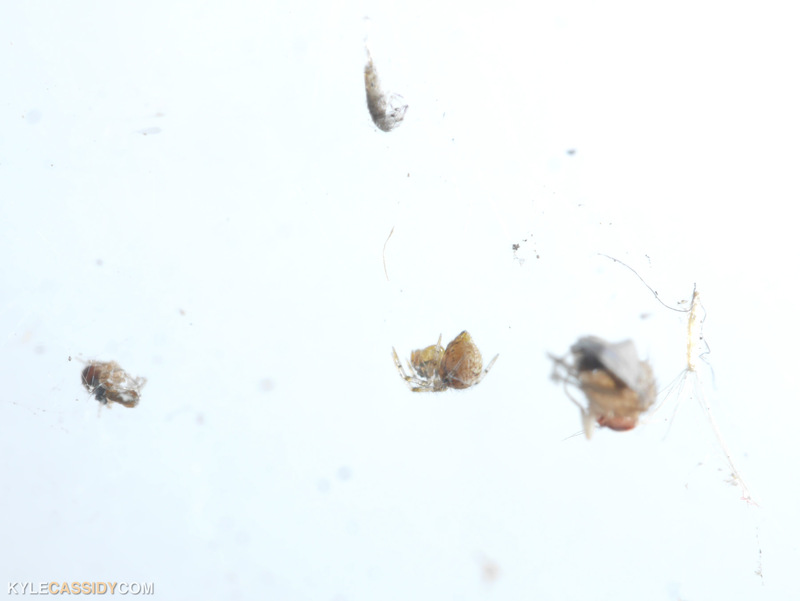 The fruit flies they were eating were four times their own bodyweight. Eventually they moved out of the Vegemite cave and found their places in the world (very close to the Vegemite cave). Photo behind this spoiler cut for the arachnophobic. This is actually Emily's baby BIGGER. But still almost impossible to see with the naked eye. Over the next few weeks three of the babies slowly vanished -- I don't know what became of them. I can't imagine something found and ate them, though it's possible. I like to think they wandered off, but I can't figure how they could have gone so far that I couldn't find them. Right now she has one baby who's moved up very close to Emily's web, about a foot away, and taken up space of his/her own. It's about 1/4 the size of Emily. And ... it needs a name. Emily compared 1:1 with her baby. You may clickenzee to celebrate!! You'll notice that Emily's baby is more festively patterned than Emily is. I know nothing about what this means. Is it a boy? Does this change? Is this just genetic variation? Who knows. So ... names for Emily's baby? Hmmm... something gender neutral. Frances/Francis? Corry? Frog? any of those hippy/movie star names like Leaf, River, Moon, etc. The photos of Emily's baby (Webster?) are amazing. Thanks for updating. Yes, I had been wondering, but didn't want to ask. I figured since you hadn't posted about Emily or the babies things had....come to an end of one kind or another. I was worried people would think that -- things just go so hectic around here with new plays starting and book manuscripts being due. the clear babies are amazing. Octavia, Or Octavian, as necessary.